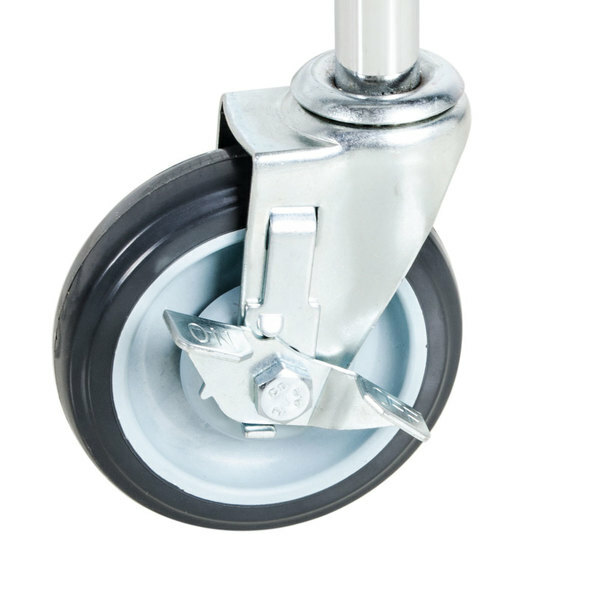 5" casters included for mobility and can support up to 1,320 lb. 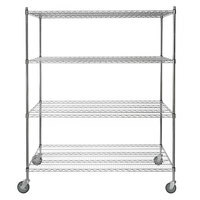 Regency NSF Chrome Wire Security Cage - 18" x 48" x 61"
Regency's 18" x 48" chrome shelf kit with 64" posts and casters is the perfect storage and display choice for your business. 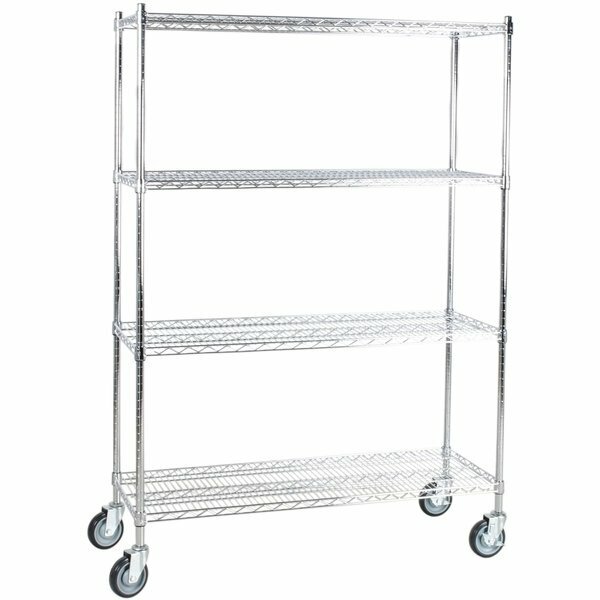 If you're looking for a mobile unit that will maximize storage and display space at your business, look no further than Regency's 18" x 48" chrome shelf kit with 64" posts and casters. 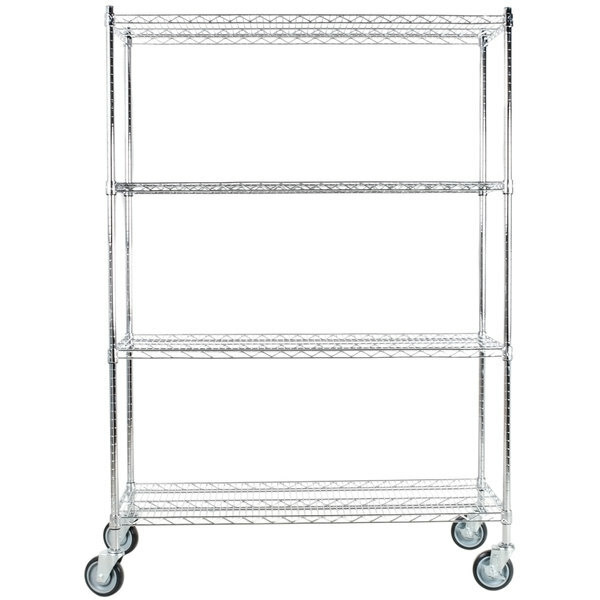 This unit is made of durable chrome, and the clear epoxy coating allows you to use it in back-of-house dry storage areas. 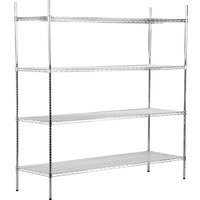 Additionally, this shelving kit is the perfect addition to your boutique or market's front-of-house display and merchandising spaces. 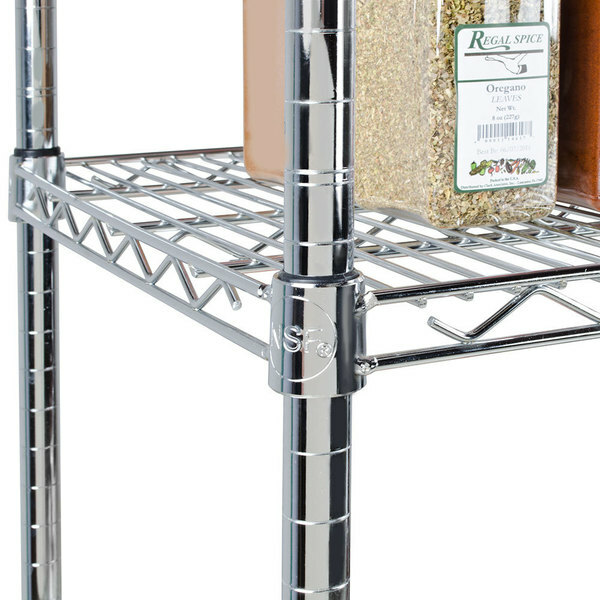 Whether you own a restaurant, warehouse, hospital, or dining hall, this shelf kit is sure to meet your needs. 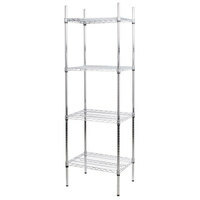 "I bought a couple of these Regency shelf kits to use in my walk in cooler and they work great. 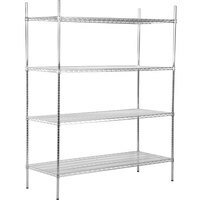 Fairly easy to assemble, seem durable, and the price is better than elsewhere." 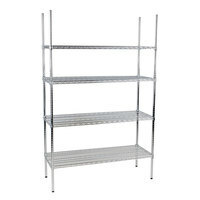 Each of this kit's (4) 18" x 48" shelves can hold up to 600 lb. of evenly-distributed weight. 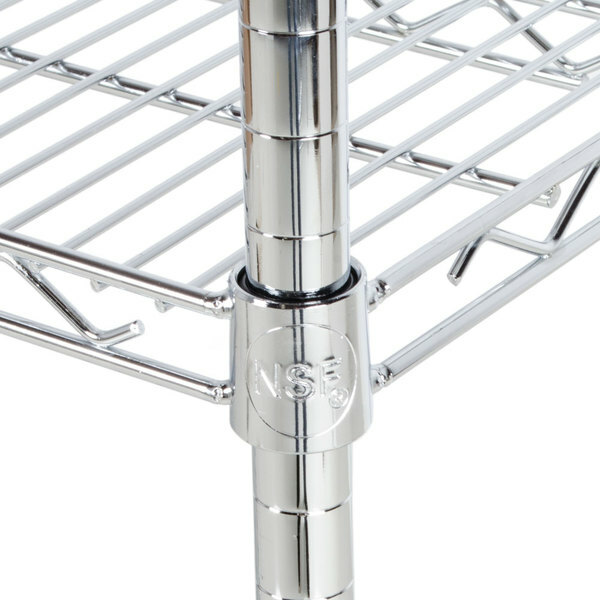 This strength and durability make it the perfect place for storing ingredient bins, boxes, cleaning supplies, and more. 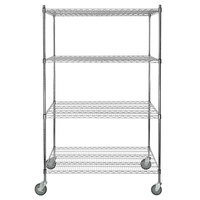 Plus, the high weight capacity helps the shelf accommodate business growth as storage needs evolve and product inventory expands. 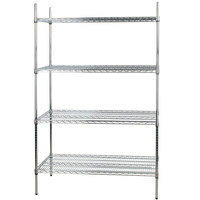 This commercial-grade shelving unit is constructed of durable chrome with a clear epoxy coating for maximum longevity. 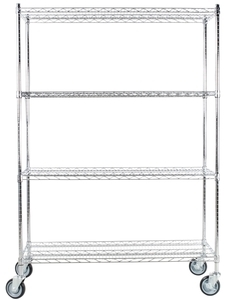 As a result, it makes for a reliable, long-lasting storage solution perfect for business applications. 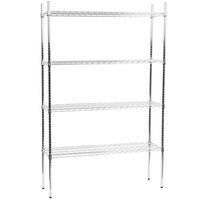 Each of this kit's shelves are fully adjustable to accommodate products or equipment of varying shapes and sizes. 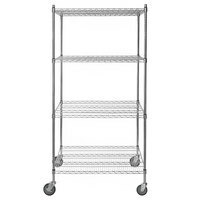 This product also offers the rigidity of solid metal but can easily be adjusted without tools or hardware. 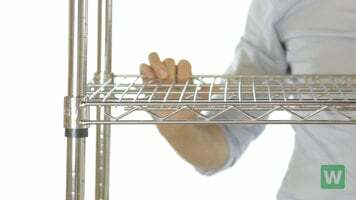 The open design of this kit coupled with the ability to move shelves to different heights facilitates ventilation and maximizes air flow between and around products. This kit comes with (4) 5" casters, allowing you to effortlessly move it from room to room. You can also roll the unit away from the wall to clean behind and underneath it. 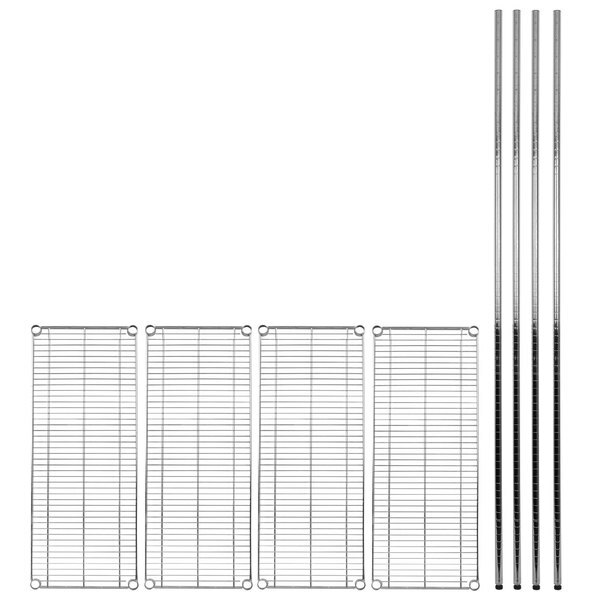 This unit comes with split sleeves for quick and easy setup and installation. To assemble, simply snap 2 split sleeves around each post at one of the incrementally-notched lines. After you snap the split sleeves on, fit a shelf down over each post to hold it in place. 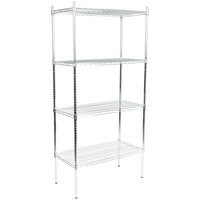 Individual Shelf Capacity: 600 lb. 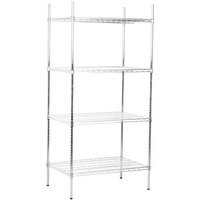 Individual Shelf Capacity 600 lb. 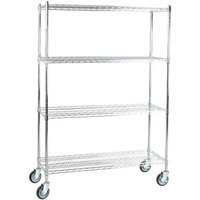 Choice Level Top Wire Basket - 14" x 20"
Choice Level Top Wire Basket - 18" x 24"
Great shelves. Really sturdy and well made. 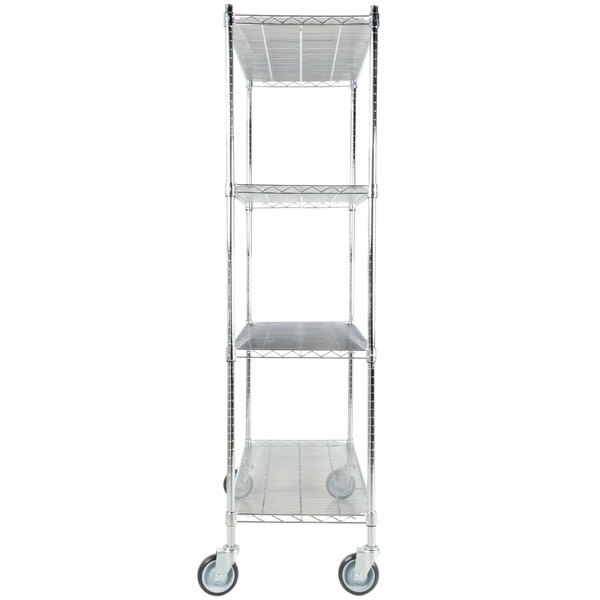 They roll easily, but with two locking casters they stay put. We load them up with really heavy stuff and have zero troubles with them. I think these are as solid as any other brand out there. 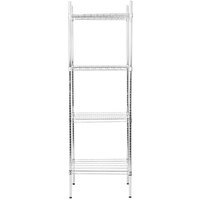 I use this sturdy stainless steel rack as a garment rack. It is strong enough to hold so many things including chef jackets, table cloths and several bins. I love that it has wheels and can be moved around easily. 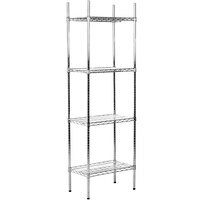 We bought 3 of these shelves. I am so happy with the ease of putting them together. The legs are numbered so you don't have to guess when attaching the stoppers. Excellent quality. A great shelf! We bought this shelf, two to be exact. We know first hand how huge they are and how much weight they hold. We store many bags of sugar and glass bottles and the shelves have not even started bending. 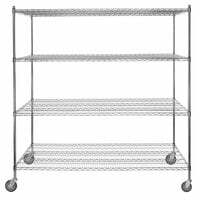 We did not install the wheels as these are kept stationary; you can also use the top shelf as extra space for storage or big boxes. Great buy! Very easy to assemble but it's best to do it with two people. I love the wheels for easy moving. Very study, I put heavy things and there's no sign of any bending. I bought a couple of these Regency shelf kits to use in my walk in cooler and they work great. 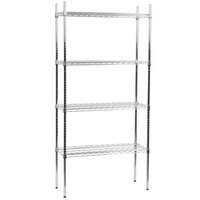 Fairly easy to assemble, seem durable, and the price is better than elsewhere.